In years past, I’ve listed out my favorite recipes, workouts and tips I use when I want to slip into those skinny jeans in a week’s worth of time. 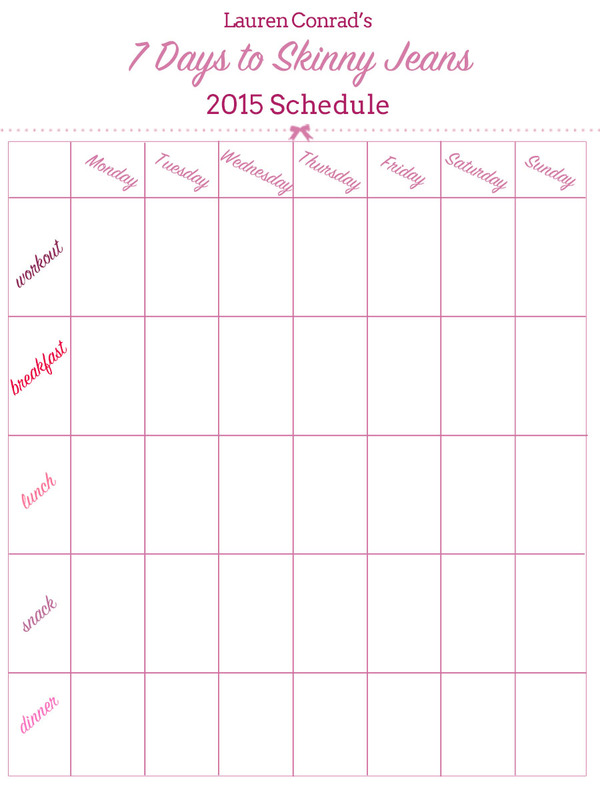 And this year, I thought it would be helpful to map out the schedule I follow so all of you can follow along too. It covers all seven days, and includes breakfast, lunch, dinner, snacks and exercises. But before we get into the exercises and recipes, it’s important to start off by setting a focused goal. In this case, that goal is fitting into those “skinny jeans.” “Skinny jeans” can mean something different to each person, whether it’s your favorite dress or a fitted top. But no matter what it is, write down your goal and hang it up somewhere you will see it every day, like your bathroom mirror. This way you will be motivated to stay on track all seven days…and hopefully beyond. Commit. Keep your eyes on the prize and if possible, enlist a partner in crime. It’s always easier when you have a buddy for support! Drink lots of water! At least 8-10 glasses a day. Click here to find out exactly how much you need. Each day, exercise, eat breakfast, lunch dinner and some healthy snacks, and make sure to get a walk in. Don’t skimp on any of these—you’ll need plenty of food to fuel your workout and you’ll need to workout to feel great! Avoid soda, sugary baked goods, and processed foods all together. Think of it as a junk food cleanse. If possible, try to sneak in your exercise before breakfast. Otherwise, just make sure you squeeze it into your schedule. This is the most important part! As you can see, everything in this weeklong plan is healthy and good for you. I truly believe that when we feel good on the inside, it shows on the outside. No matter how many cocktails you had over the holidays, if you stick to this plan for one week you will start feeling better immediately. Then, see if you can keep up the good work for another week…hopefully this plan will turn into healthy new habits. I’ll be starting this plan tomorrow, so let’s help each other do it together. 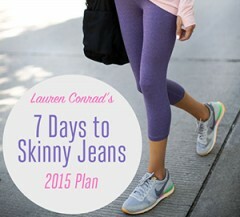 Will you join me in my 7 Days to Skinny Jeans 2015 plan? Be sure to check in with your progress each day in the comments below. And, on day seven, snap a photo of yourself in those good old skinny jeans and instagram it with the hashtag#LC7daystoskinnyjeans. We might even feature you right here on LaurenConrad.com!